On May 20, 2011 the Good Pitch touched down at the Ford Foundation in New York City with eight pitching projects and over 260 decision-making attendees, ranging from foundations, NGOs and campaigners to philanthropists and social entrepreneurs, from policy makers to international brands and advertising agencies. The eight benefitting projects are Crime After Crime, Dir. Yoav Potash; Not In Our Town III: Light in the Darkness, Dir. Patrice O’Neil; Brooklyn Castle, Dir. Katie Dellamaggiore; Untitled Global Health Documentary, Dir. Kief Davidson; Ai Weiwei: Never Sorry, Dir. Alison Klayman; Who Is Dayani Cristal?, Dir. Marc Silver; We The People, Dir. Soniya Kirpalani; and Gideon’s Army, Dir. Dawn Porter. With projects focusing on issues of immigration and migrant labour, human rights and global health, racism and hate crimes, domestic violence and criminal justice and stories from The Emirates, China, USA, South Asia, Haiti, and US/Mexico/Central American borders, there was much to interest, engage and ignite this dynamic flash community. In an unprecedented wave of funding offers, over $500,000 was pledged on the day - more than at any other individual Good Pitch event - with three of the eight films walking away fully-funded. 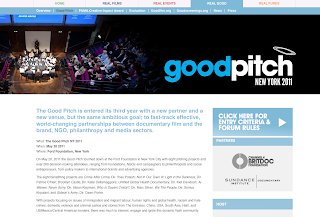 The offers of fiscal support at the Good Pitch NY 2011 bring the total funds leveraged by Good Pitch events to over $3m since 2009. But more than that, each of the 81 influential round-table participants offered something unique to the pitching projects aside from funding, a true potlatch of resources: access, finance, outreach and networks that filmmakers alone struggle to arouse. Sundance Institute Documentary Film Program offered Ai Weiwei: Never Sorry a production grant with an anonymous donor giving completion funds. Sundance also gave a production grant to Who is Dayani Cristal? with Impact Partners putting forward finishing funds and PUMA.Creative adding an outreach and travel award. We the People aroused the interests of ITVS and Chicken & Egg Pictures and left the event fully-funded via a private donor. Untitled Global Health Documentary was offered a finishing grant from Ryan Harrington of the Gucci Tribeca Documentary Fund. To read about the eight projects, visit the web site.